Whether you shop for holiday gifts or crave to find a bargain, there is no better time than Black Friday. Many discount-hungry shoppers line up for deals outside of their favorite Black Friday stores and wait for the doors to open. Black Fridays, long a byword for stampede and excited crowds, had also been scenes for tragedies. Social scientists and psychologists are trying to find out what drive shoppers to violence when it’s time of the year to give thanks. Here are some of the worst things that happened on Black Friday in the U.S. history. In Palm Desert, California, at Toys ‘R’ Us in 2008, two men killed each other in a gun battle after they had gotten into a heated argument. Their wives had been fighting as well. Both men had guns and shot each other dead during Black Friday. A 34-year-old temporary Walmart employee was killed in 2008 as hundreds of customers flocked inside the store while the employee was trying to save a pregnant woman. 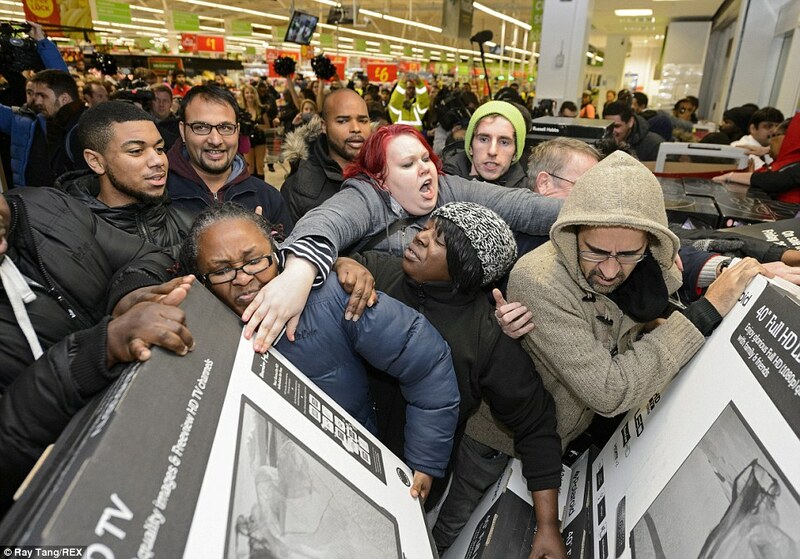 In Long Island, NY, Black Friday shoppers blasted the doors open with body force 5 minutes before the scheduled opening time. In a Walmart store in the nearby Los Angeles neighborhood of Porter Ranch, Black Friday took an ugly turn when a woman fired pepper spray at a crowd of shoppers. The incident in 2011 caused about 20 people suffer because they were struck in the face. Woman was trying to keep the shoppers away from Xbox game she wanted to purchase. In a West Virginia Target store, in 2011, 61-year-old Walter Vance collapsed on the floor during Black Friday shopping. Witnesses said shoppers ignored the old man lying on the floor and kept shopping. Later, some nurses who were shopping at the store performed CPR until an ambulance arrived, but Vance died at a local hospital. U.S. Marine CPL Phillip Duggan was stabbed by a shoplifter while collecting donations for Toys for Tots charity at a Best Buy story in Augusta, Georgia, in 2010. Shoplifter Tracey Attaway stole a laptop and some other good from the store. Duggan attempted to prevent him from leaving the store but Attaway stabbed the marine in the back. Fortunately, Duggan’s injury was not severe.